Showcase your love of flowers by placing the Gardman Zinnia Kinetic Wind Spinner in your garden. This dynamic, vivid artwork lends a cheerful look to your backyard or landscaping, with its recognizable silhouette and lasting construction. A 20" diameter flower shape makes a stylish topper, and each of its eight petals curves at the front for extra drama. These large shapes connect to a central hub, with additional, smaller petals around it for dimension. This topper spins on its bearings, adding moving style to the area. The copper colored finish throughout the unit offers a bold look, and the hammered pattern on each petal lends exciting texture. Verdigris hints beneath the copper hue add an antique feel to the piece, while the 53" tall stake brings height. A 5.5" long, step-in base ensures this sculpture is stable in your garden, while the pointed legs install into soil in moments. The all metal construction looks fantastic for many seasons, while the copper and verdigris colors offer a classic finish. 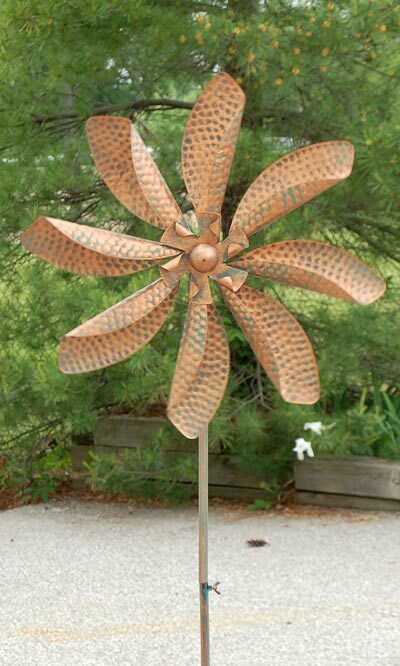 Keep a bloom in your backyard all year with this Zinnia Kinetic Wind Spinner. Some assembly required. Availability: 4 in Stock. Ships from OH within 24 business hours , 4 available at this price!